I am thinking about preordering the HDFury DIVA. I hope to use (PS4Pro + PC +) ATV4k through HDFury into LG C7 + Denon AVR + Ambient Lights. The ATV4k can send LLDV. Is there any disadvantage to LLDV? From what I can find the tradeoff is not quality, rather LLDV requires the source to do a lot of the processing (instead of the TV). From what I have read the LG C7 supports LLDV so that's covered. In the promotional pictures the current series has a green oled, and the new series has a blue oled. Is this configurable? I would like to make the oled red (less distracting), is that possible? Is there any plans for HDFury to make a really cheap splitter? Without any HDCP doctor, without any EDID? Just a super cheap splitter for people to use to send output to multiple TVs (or same TV but different ports)? Is it possible to directly wire the IR interface between Logitech Harmony hub and Diva/Vertex2? It is confusing the purpose of the Diva "IR Sensor" and "IR RCV" ports. Obviously the 6ft IR sensor that comes with unit plugs into the "IR Sensor" port. Therefore, what is purpose of "IR RCV" port and can the Harmony hub output be wired directly into it? If harmony hub use IR, then yes you can connect directly to IR sensor input. If it use data, then you connect to IR receiver. The purpose of having 2 different IR input (+1 direct IR windows when device is in line of sight) is especially made to make it compatible with anything in existence today. 1. Regarding 3D, how will the ambient lighting feature react on TAB / SBS content? 1. Not supported at the moment, but there will be firmware update for that soon after release, need some design work and add some code for 3D>2D conversion internally before it goes to the light processing. frame packed 3D should be ok, sbs and top/bottom need special dev work to be added. It is an urban digital legend to believe that there should be a led at each corner, in fact, there is more intensity than anywhere else at each corner if there is led to each corner, while ledkit should be an extension of the current central picture of your TV and not something that bring more intensity in each corner than anywhere else. Use Automix/SINK mode for DV support on AVR-Key/Integral. Linker does NOT support all DV. Want to get DD+ and ATMOS sound from TV streaming Apps back to an AVR via HDMI since it fails via ARC or S/PDIF? Show interest by posting your TV and AVR brand/model. We might select you in the future for some beta test. Long time lurker, first time posting here, so good afternoon ladies and gentlemen. Thank you all for a great deal of information, and thank you HDfury for awesome products and unparalleled support. I'm interested in your new product line (you just can't have enough HDfury products), but I need some answers to decide if I "need" Diva or Vertex2. 1. Can Diva (independent) output from two different sources at once? For example - pass 4k or 1080p from input 1 and convert 4k HDR -> 1080 SDR from input 2? If yes are all combinations possible, or are there only predefined patterns (i.e. inputs 1 and 2 to output 1, inputs 3 and 4 to output 2). Can Vertex2 do that? Does it have independent outputs? 2. Can Diva convert 4k HDR -> 1080 SDR on both outputs? 3. I already have Vertex and X4. Will Diva's 4k HDR -> 1080 SDR conversion give me some benefits over conversion made by Vertex + X4? Does it work on your European site too? I prefer payment in Euro if possible. 1) yes all new generation hardware can process 2 signals at the same time (Maestro, Diva, Vertex²), you decide which inputs goes to which output, it's a MATRIX, so no limit. 3) Yes, but later X4 should catch up! so after a few months it should be similar, this is because we first used X4 as a proof of concept (beta), then implemented in Diva design, now working on all additions and future update/features on Diva and later we will port what we can port back to X4. 4) You can trade in HDfury unit bought elsewhere for a newer one with us, yes. We don't have any european site, there is only one official source and it is www.hdfury.com, anything else is a reseller website. 4) You can trade in HDfury unit bought elsewhere for a newer one with us, yes. We don't have any european site, there is only one official source and it is www_hdfury_com, anything else is a reseller website. Thank you for your answer. May I dig a little deeper? 2. Can TX0 downscale 4k -> 1080? I mean 4k -> 1080 (without HDR conversion) on TX0 and 4k HDR -> 1080 SDR on TX1? Or is TX0 only for passing through? 3. Will X4 with ported Diva's features still be able to process 3d image to RGBHV devices? Or do I have to flash 3dFury firmware to process 3D and reflash new x4 firmware to convert HDR -> SDR? Does X4 have similar hardware capabilities as Diva when it to comes to HDR conversion, so all Diva's features can be ported? If "yes" maybe it's better to go with Vertex2 and leave HDR conversion to upgraded X4. 4. I asked about "trade-in 10% discount for customers who ordered at least once since 02/2017". I guess it doesn't work with purchases from resellers? Could you elaborate on that trading HDfury unit bought elsewhere for a newer on? Can you reveal how trading Vertex for Diva or Vertex2 would affect the price of these two? Or should I contact your customer support with that question? 2. No TX0 cannot downscale, it can chroma, colordepth, colorspace and hdcp convert only, for ex if input is 4K60 422 12, it can output 4K60 420 8b, or the other way around. It can also UPSCALE, if input is 1080p it can output 2160p with any chroma, colordepth or colorsapce or hdcp, this is same as Vertex/Integral2 and also same than Maestro TX0 or Vertex² TX0, all our TX0 are similar. 4. No of course, resellers do their own policy, out of our control. We love freedom so we let them free. For trade in value and questions please use email. How good is the tone-mapping on the Diva on the HDR->SDR HDMI/downscale output port? Would it look the same as if HDR was left off in the first place? Depends the source and the sink. if sink is bt2020 and source can send bt2020 sdr, then its different than 709 sink and source sending 709.
the purpose of tone mapping here is to allow Any 1080p SDR display/capture card or equipment (such ambient light/AVR, etc..) to get proper colors when main signal is 4K HDR. Hi. I have a Diva on order! I had a few questions on the Ambilight feature. I watched the YouTube video -- impressive. 1) Can you adjust the light intensity level? In other words, still have it run in Ambilight mode but be able to reduce or increase the brightness. 2) Can you disable the Ambilight mode and just set it to a constant background color? For the Vertex, Claw and other worked with you to provided Macros based on HDR/DV/HLG information. From what I recall, these sent commands out the RS-232 port. You had mentioned that the Vertex did not have enough memory to provide the same kind of Macros that would instead modify the EDID on the fly. Is there any chance Diva could get this implemented - Macros that work on the EDID rather than output via RS-232? 1) Yes you can adjust each R/G/B intensity value from 0 to 31. I was hoping that you guys could expand the existing Macro function to now allow modifying the HDR Metadata and/or AVI info frame for HDMI use. The present Macro function provides a way to use conditionals to modify things like MaxCLL and Max Brightness (Luminance) "on the fly". Right now you are doing the examination and conditional step but sending information out the RS-232 port. Very useful for JVC projectors. Those of us that have LED/Oled flat panel sets can't really use the Macro function. We had debated this a while ago on the Vertex thread. You had said Vertex did not have enough memory to this. ^ If implementing this sort of functionality in the newer and/or future products, consider implementing it in such a way that the feature doesn't permanently consume a ton of memory to support a single brand. Instead, set it up so that it's somewhat modular; I think some people are justifiably disappointed that there's no memory left on the Integral, Integral2, and Vertex because so much space got used up to support JVC projectors. We already have feature to replace HDR metadata, can you explain why this should be Macro section instead of current HDR section ? Also, the new hardware already have option to edit any HEX sent out so it can control any RS232 display including many others brand than JVC. so I'm not sure to understand what you mean exactly, please elaborate. There is no current Macro function that uses conditionals to modify HDR metadata. The existing macros in the Vertex send RS-232 commands to select an existing user mode in the JVC projector based on the content type. (Because us JVC owners are lazy and can't be bothered to change user modes manually ). No metadata values are modified. It might help explain what you are looking for if you were to show what options other than "Do Nothing" you would want included. 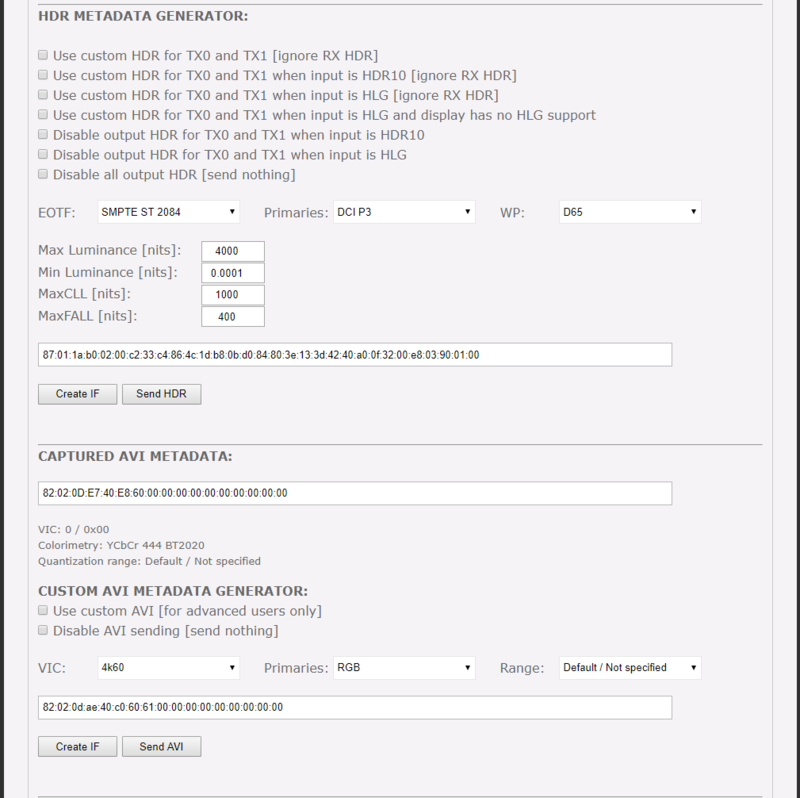 And based on this browser GUI screen shot from the HDfury website that shows the HDR metadata injection options, how would you want it changed? I am guessing that you want to be able to control the output values for Max Luminance and MaxCLL based on content metadata value ranges. Last edited by claw; 04-15-2019 at 09:15 PM. Can Ambilight LEDs be spaced enough to use on a projector screen? Not currently, but we are working on it, there will be a special page to buy ledstrip including solution for projection screen. Please let us know your projector screen current dimension and its distance to wall. There is 2 very different conditions, one is folding screen, other is static screen. on folding screen, you need to install special led (90 degree > light goes beside) on the wall directly since it cannot be on the folding screen. on static screen, you can install normally. Last edited by HDfury; 04-16-2019 at 04:15 AM. Quick proto test, lightstrip dimension not adjusted optimally. Last edited by Dante Williams; 04-16-2019 at 12:14 PM. All I was suggesting is being careful about consuming huge amounts of the available memory for a feature that's very specifically targeted to a specific product without some provision to make that feature optional. It's sort of frustrating for people to be told there's no memory to fix problems X, Y, and Z in the previous hardware because so much memory was used to support JVC projectors. It's really cool that you guys are willing to add features like that, just be mindful when doing at what the ramifications may be for the broader pool of users. My dear friend, we did this new generation (Maestro/Diva/Vertex²) especially for that purpose: to offer the best possible options to anyone, we have loaded it with tons of memory, proof, we are running our own webserver on it and we can retrieve data from Internet if needed. (Internet data retrieval not yet implemented). What was once reserved to JVC users is now open to anyone thanx to new memory resources available. JVC Macro is a nice routine (thanx to Manni) that now any RS232 capable display can make use of and as others suggested already, it can now be tweaked to do more than just RS232 instruction based on content type. Once people get first units, give us feedback and list of things you want and if it makes sense, we will add it as always. First users and best early thoughts will always lead the dev, that's how it is. I'm sad when someone comes 2 years after release and ask something that sounds a good idea but cannot be added anymore due to limited memory but we as a company we have to first support people who trusted us and pre ordered our devices. They play an enormous role in what the devices will or could become after release. What is important for us is that if you like our work, get the words around about our devices, the more we can move the cheaper they can be and the more we can add and better/stronger will be upcoming ones. As you might know we are kinda blacklisted in mainstream due to past legal battle and freedom fighting arguments we had with industry giants, we can only survive with hardwork, skills and ALL OF YOU. Last edited by HDfury; 04-16-2019 at 04:24 PM. @HDfury @claw - thanks for the clarification. I didn't realize that the Macros sent JVC commands - not modified metadata. @claw , you are correct - I was thinking it might be useful to "conditionally" change HDR metadata. Rather than simply force the metatdata to a single specific Max Luminance and/or MaxCLL, have a condition where, for example "if" MaxCLL is greater than X (like 4000), allow us to set it to Y (i.e. 1000). Ok, now that I am asking for features - here is one that could be useful for many of us. I see that Diva/Maestro has a feature where it will display test patterns. Great, nice. How about the ability to upload a test pattern and display that? Diva is on the network, upload time should be reasonable and, with a built in HTTP daemon the ability to use something like curl to send a file to display would be useful for calibration. Even better, a method not unlike the rpiGenerator that @zoyd uses with HCFR. A user created a network attached Raspberry Pi software distribution that displays Grey Scale and Color patterns that HCFR can control and measure. I am not sure the protocol @fru menzo uses on the Pi to accomplish this but I doubt it is complex. Where this falls apart is the fact that the Raspberry Pi only supports 1080p... With Diva's ability to output full 4K and HDR - it would make a great pattern generator for HCFR. @claw, you are correct - I was thinking it might be useful to "conditionally" change HDR metadata. Rather than simply force the metatdata to a single specific Max Luminance and/or MaxCLL, have a condition where, for example "if" MaxCLL is greater than X (like 4000), allow us to set it to Y (i.e. 1000). Even better, a method not unlike the rpiGenerator that @zoyd uses with HCFR. A user created a network attached Raspberry Pi software distribution that displays Grey Scale and Color patterns that HCFR can control and measure. I am not sure the protocol @frumenzo uses on the Pi to accomplish this but I doubt it is complex. yes I asked but I also asked that you get unit first and make suggestion afterward reason is there is already greyscale pattern, so better check what's there first and then ask what you want to see on top of that. Displaying graphics is possible but not yet implemented thus, so I note that down. Fair enough. Looking forward to getting my Diva!